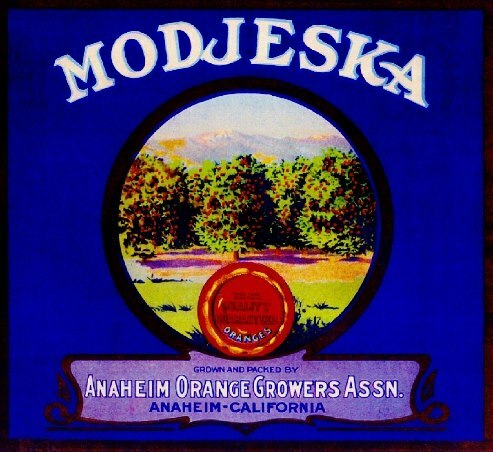 The Brotherhood of Eternal Love was incorporated as a non-profit organization in Modjeska Canyon on Oct 26, 1966—a few months before John Griggs and other founding members relocated to the Woodland Drive neighborhood of Laguna Beach, CA (later known as 'Dodge City'). [- per Nick Schou's book Orange Sunshine, 2010]. 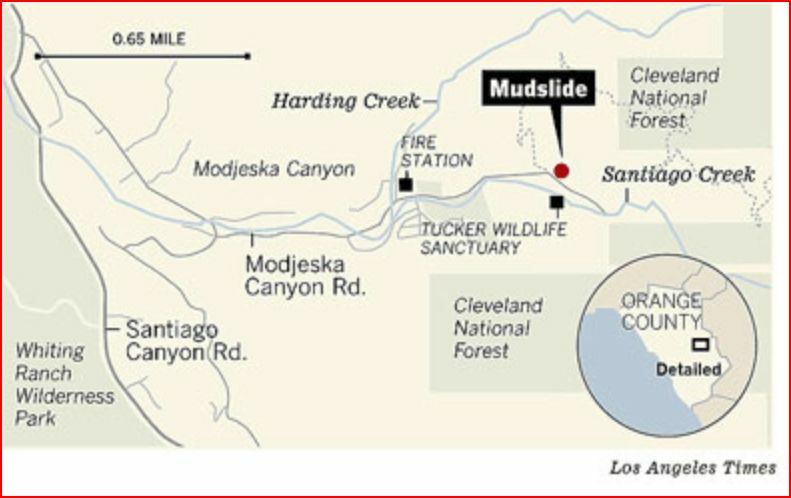 Modjeska Canyon is a deceptively rustic segment of Orange County. It's a reasonably close commute to where residents need to be, but light-years away from suburban life. It is, quite simply, a particularly gorgeous nowhere. 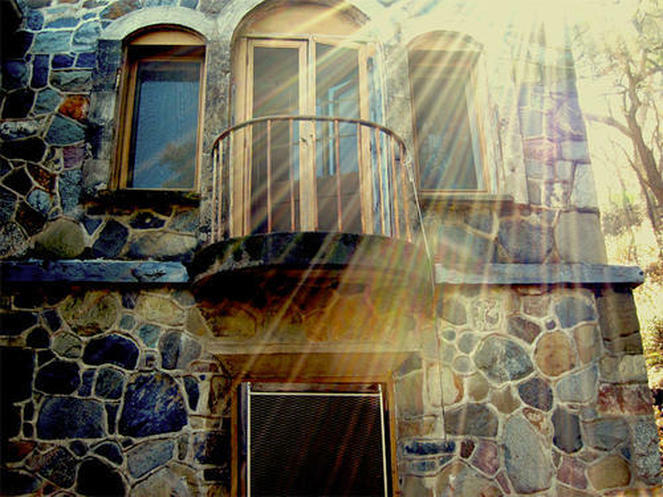 The Brotherhood of Eternal Love (1966), a tax exempt non-profit spiritual organization, was dedicated 'to bring to the world a greater awareness of God through the teachings of Jesus Christ, Rama-Krishnam Babaji, Paramahansa Yogananda, Mahatma Gandhi, and all true prophets and apostles of God'. 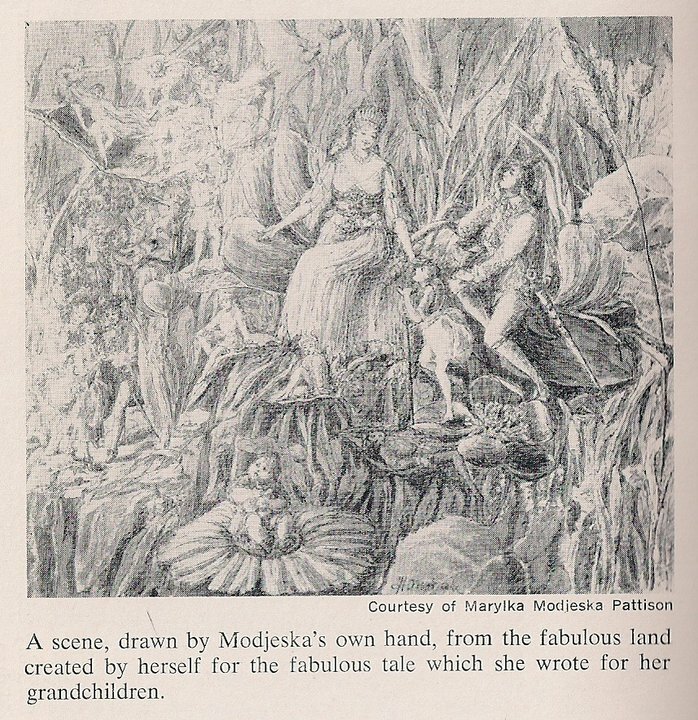 From the book Wanderers Twain, Helena Modjeska her home in the canyon and some artwork she did in the late 1800's. 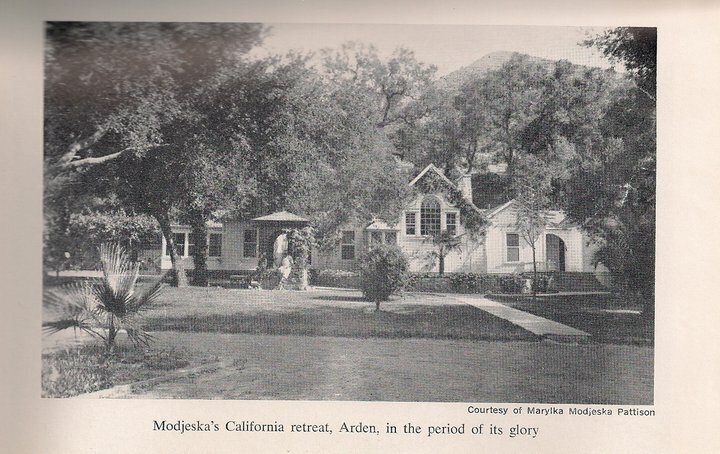 Modjeska Canyon is named after the 19th-century Polish stage actress, Helena Modjeska, who settled in the canyon in the late 19th century. Her home from 1888 to 1906, "Arden", is a National Historic Landmark. Amongst various lagoons, canyon wildernesses on the akashic pacific shores, within the realm of real time and around a corner from various places like Modjeska Canyon and others was a place inside of the hearts and minds of long haired naked pacifist sun worshippers, wandering in the nature lands, singing songs, eating fruits, fasting, praying, doing yoga, playing guitars in huts and befriending American Indians, all in the 1930s, 40s and 50s. This was the time in that running up to the SF rennaisance carnival of a Troubadour friendly St Francis and the oriental garden in the park wherein shone the akashic golden gate, and all its merry troubadours passing through, making an effect on the aethers of San Fran, wherein also were the 8 Hashbury chess players of akasha who played games which came to life too, besides the Rosicrucian lodges of Pascal Beverley Randolph with their Rosicrucian chess play and hasish reveries. San Francisco historically is also the place wherein the first American chess club was. Therein inside the games of this first club, and around few corners from them, a white rabbit could take someone to a realm somewhat connected to a psychedelic version of an Edwardian faerie story akin to Winne the Pooh, Wind in the Willows and that sort of thing which was a aplce near another one detected in various science ‘fiction’ scapes of Heinlein and others. Back to the nature wandering hermits though. Nature boys they were called and of various stock they were, of English, of German and of other. Of various backgrounds Christian and Jewish. Meditating and doing yoga, eating pure foods, sunbathing and waterbathing and connecting with the wilderness they were a different breed of different visions to those of the settled gold trailsters and cattle ranchers, they were America’s equivalents to the sadhus, babajis, yogis and sants of India, of the wandering hermits and friars and beghards and beguines and holy fools and such kind in Europe. Inside their visions were things they had inherited things which went back further, things of the German spirit and nature far from the Hitler-Nazi perversions, free from the inquisitions and rule of men in this world, the men of might and their tribulations and that storm of the quarelling spirit. Free they roamed and inside their visions, were the wood hermits of Greychester’s Grail forest leaning towards things one can only understand in that curious brand of nature mysticism found in the works of Thoreau, of Emerson, of transcendentalism somewhat, things we can also see in the background of influences on Herman Hesse and expresed by Hesse in his tapping into that self same storyland of Chesstoria. THese matters are those concerning the Greenwoods, things concerning those insights which gave rise to the thoughts of the founder of Naturopathy and those working in its various historical clinics, some in California and elsewhere in the States. Going even further back we can see the Rosicrucian and Paracelsian fords and pastures and their glimpses of places further east, in North Africa, in Morrocco, Spain and Damascus, Syria and India by the side of the woods of the Grail hermits of the woodland of Grailchester. Oriental Nature Boy Mystics on the akashic planes, housed the river of traditions arcane and forgotten and a spirit of freedom. Not all nature boys were celibate and single, as some took their girlfriends and wives along as well. There were nature women too. On the akashic plane they were the graceful representatives of Venus Sophia, in nature and free from the cities visions and hopes amongst the dust and grime, of the egoic skyscraper’s ascension away from the loving community of people, away from nature encased in the granite prisons which stretched in a rushed manner to the skies with not much regard for the people below even. Chasing the nationalistic and internationalistic will o the wisp of world dominance is bound to fail despite whatever good things appear to be along the way. More ill than good comes out from it and nature people sought freedom. Laguna Beach, is also a place in the ambit of nature boy and girl wilderness wandering, and this scene took in curious akashic surfers who could cross oceans on their magical surfboards free from the inquisitions against the elixir. Working class mystics who had given up the car gangs of beachrealm, and took to surfboard, yoga and pure foods not to mention psychedelic alchemistry and loved the music of the merry traibes of SF. Before this period, Laguna Beach also housed bohemian types, artists and was a faved retreat renowned for its natural beauty. Somewhere amongst these were esoteric interests of a group named the Order of Loving Service who harked back to an important inspiration, a Baba Premananda Bharati, who in the first decade of the 1900s established various Krishna congregtions centered on an ashram in Los Angeles caled the Krishna Home. Many of California’s esoterically inclined came across it, one such being a Maud Lalita Johnson, a famed esoteric writer in her own way. Another called Elsa Barker famed for her many esoteric novels and imagination scapes, all these amounted to a contact of the iterary imagination with a certain branch of the first wave of Krishna Chaitanya devotion in America before the more popular branch appeared later in the 1960s onwards, from the Bowery Beats and Hipsters of SF to all around the world. Premananda Bharati belonged to the Krisna traditions of Chaitanya, the blessed madman and holy fool and incarnation of Krishna who bathed Bengal in waves of ecstatic love of Godhead. This Krishna baba had an influence of Gandhi and Tolstoy, worked on a rival newspaper in India to that of Rudyard Kipling and worked ona novel called Jim which was the antithesis of some of the things in Rudyard’s Kim. But the two world wars meant that this period of the oriental in American esoteric latter day semi Rosicrucian influenced traditions within groups such as New Thought, the Golden Dawn, the Theosophical society and others were largely forgotton, remembered by only a few, until recently. But all that is known is that the Order of Loving Service published a book dedicated to Baba Premananda Bharati in Laguna Beach and that it was associated somewhat with the Royal Order of Tibet founded by George Adamski who was the pioneer of UFO abductee narratives. This Order of Loving Service was also inspired by the writings of Lalita Johnson and it was her book with the dedication to Premananda that they published in Laguna Beach called Square, which upon a higher plane is the akashic chess grid lattice of Sophia Venus, even though this is not mentioned by the author herself. It was later in 1969 that another Krishna temple of a different lineage appeared in Laguna Beach, that of the Krishna tradition represented by a famed guru named Bhaktivedanta Swami which is more commonly known amongst the latter day hip and beat. Certain folk in this new Krishna temple in Laguna had links to another group named the Brotherhood of Eternal Love, whom some of them took inspiration from the Krishna tradition, the chanting and dancing despite them thinking it was all a little too orthodox for their liking, nevertheless each group helped other in certain regions concerning trade.